Whirpool is a known America brand which has occupied the Indian electronics market decades before. They have stepped in the Air condition category in India around 80s, since then they are trying their best to capture the market. Their ACs are known for their innovative design and powerful make and they have a lot of options for both split and window ACs. If you are planning to buy the best Whirlpool AC in India, then you are at the right place. In this article, we are covering the best of best ACs from them. The products chosen by us are best in terms of cooling efficiency, price, features, modes, material quality etc. For finding out the best one we have personally tested them and looked for Whirlpool AC review from various websites and existing customers. So, let’s start with the Whirlpool AC Review. Down below you will find information about what technology and design the Whirlpool ACs have. This will also help you understand what is the uniqueness of this AC and how well they will fight against the summer heat. All these features have made them fall under the category of best AC in India. The split ACs from Whirlpool come with an advanced 6th sense Intellicomfort technology. It comes in a smart embed logic chip inside the air conditioner. It aims to rid you off all the varies of setting the temperature settings for for a higher or a lower than normal humid day. The technology works for faster cooling by enabling a smart communication between the indoor and outdoor unit to adjust and adapt the AC Operations on basis of humidity levels in your surrounding. For example, when the indoor unit sense a high humidity level than it communicates with the outdoor unit to increase the condensation and lower the fan speed and vice-versa. This ensures your room is always cool with no humidity. Further, this kind of technology proves to be very useful in India during the monsoon season when the humidity levels are too high. In standard ACs, there is a single vent to remove the hot air from the room which decreases its cooling efficiency. But in the innovative whirlpool ACs there is a three dimensional system. For the same, they apply 3 air vents system that pulls out all the hot air from the room much faster and thus aid efficient and faster cooling. Further, with multiple vents the heat exchange rate is much faster which ultimately gives you faster cooling, reduces the pressure of refrigerant gas loss, and produces less noise. Studies show that with 3 vent 3D system, you will get 40% faster cooling, up to 12m long air throw, and cools your room even at 55°C. Not only this it is also seen when your room is cooled up faster than there is less usage of electricity. Particulate matter(PM) 2.5, is the most common pollutants found in India homes. These pollutants are a major cause of nasal allergies, throat irritation, cough, chronic bronchitis, reduction in smooth lung functioning, etc. The Whirlpool AC not only cools your place but also aid to fight against these pollutants. 2. Anion filter: This aims to remove all the PM2.5 pollutants. In this range, it removes the bacteria’s, virus, dust mites, mildews, and other small pollutants. 3. Silver filter: This aims to remove the PM2.5 and other strains of bacteria’s that are not removed by the anion filter. 4. Activated Carbon odor filter: This aims to remove the bad odor form your room. This way the best whirpool AC makes sure that not only your room is cool but also your health is safe and sound. Most of region in India suffer from load shedding or long power cut issues. And the ordinary ACs don’t work with the inverters. Looking into this need the best whirlpool ACs have comes up with an intellisense advanced Inverter Technology. 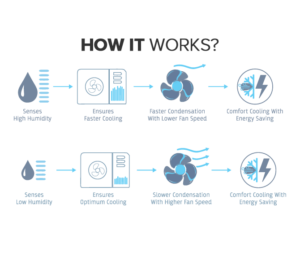 This technology adapts to your cooling needs while reducing electricity usage. With this technology you can have a lifetime savings of up to INR 62000 on your electricity bill. Further, the technology is also designed to adapt to voltage fluctuations which is another major problem in many Indian regions. It can easily handle the voltage fluctuation from 140-264V. Whenever, a low or high voltage is deducted the unit cuts off the power supply, and again restart with already set functions once the voltage is normal. All these functioning makes the AC stabilizer-free and noise free too. In addition to all this, this technology also aims to protect vital components of AC from voltage fluctuations. You don’t need a stabilizer if you have a power range between 140-264V in your area. But if its beyond this limit than you might need a stabilizer. Copper is the most desired material for AC’s condenser. But the copper quality should be premium class. A copper condenser aims to enhance the life of your AC and also aid in cooling as the heat exchange rate for copper wires is much better than others. Whirlpool ACs uses the premium class copper wires in their condenser. These condensers are much easier to maintain and use. Statistics suggests the copper condensers last you for around 9-11 years if they are maintained and used well. The idea of smart home has already entered the Indian market. With this feature you can control your appliance from anywhere using your smartphone. All in all its a luxury feature to have access to your appliance from anywhere and at any time. Most of the new whirlpool AC models comes with this wi-f enabled smart feature. They let you set your room to your favourite temperature from anywhere via your Smartphone. For this you need to download a Whirlpool App on your phone and connect your AC with your wi-fi. The Wifi Connectivity in Whirlpool ACs gives you the ease of operating key functionalities like switching on or off, setting temperature, easy scheduling and even tracking your dust filter. This makes the whole maintenance process much easier. It proves most handy when you want to slow down/off the AC in the middle of the night and you don’t have the courage to get out of your bed. The new advanced ACs from whirlpool come with an advanced MPFI(Multi port fluid injection) technology with a 4*4 circuit design. This circuit aims to get rapid heat exchange rate and much faster cooling. Further, the tubro cool along with MPFI aids to rapidly cool your place by taking the fan speed to the highest and cooling your room in just few minutes. This feature is very handy when you come to your home from the scotching heat of the sun and you want to cool your room and relax instantly. This is the best Whirlpool AC in India known for its excellent performance, cooling efficiency, and high energy saving technology. Whirlpool 1.5 ton AC fits to any room size of 120 to 180 sq ft. We recommend it use it for your master bedroom or living room. It has two powerful technologies 6th sense fast cool technology and MPFI technology which gives uniform faster cooling even at 55 degrees. Be rest assured, even with the advanced technologies its going to consume little of electricity with its intellisense inverter technology. Furthermore, what else you can find this AC is a long term 10 years warranty, 100% copper condenser, turbo cool feature, and stabilizer free operation. This one is a smart AC for smart people. It has all the standard features and a unique feature that is wi-fi compatibility. Whirlpool 1.5 ton is a Wi-fi inverter split AC. What is unique in this AC is its smart technology. The Wi-Fi connectivity lets you operate your AC through your smartphone. With this feature, you can set the temperature, on/off your AC, and track your dust filter from anywhere anytime. On the whole, you can operate the entire AC functionality from your phone instead of the remote. 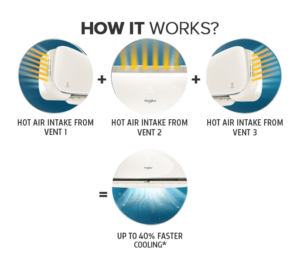 The 3D cool technology and the intellisense technology aids in faster rapid cooling and also aids to reduce humidity from the surrounding air. This makes it very comfortable for use in monsoon season when there is a high moisture content in the air. Lastly, it is also equipped with few great features like 4 way filters to remove odor and pollutants from the room, summer chill, turbo, humidity removal, and power saving mode. If you are looking for the best Whirpool window AC than this can be the best choice as it has great features and performance. Whirlpool 1.5 ton is a window type AC. It fits to any room size of 1100-190 sqft. It cools effectively even at highest temperature. For the same, it has super high EER rotary compressor with built-in Japanese technology. This not only makes the AC life longer, consumes less electricity and provides powerful cooling. Further, it has the 6th sense energy saving technology that saves down your electricity bill considerably. Lastly, few other good features are free installation, energy saving mode, sleep mode, and turbo instant cooling. This is one of the fastest selling AC from Whirlpool. It is a perfect choice for small to medium size room. Whirlpool 1 ton AC is a inverter split AC with all the standard features. It fits to any room size between 0-120 sqft. The AC is made from 100% copper wires which enhance its life and also aid in faster cooling. Further, it has 6th sense power technology to adjust the temperature of your room as per the requirement. Like when there is high humidity, it is detected by the unit and the refigerent heat exchange rate is increased to balance out the moisture level. Few other great features of this room are long air throw, stabilizer free operation, and 40% faster cooling. This one is meant for small rooms only. You can cosnider this one for your small room like your kids bedroom, office, study room or your guest bedroom. Whirlpool 0.8 ton AC is a inverter split type AC fitting to room size between 0-120 sqft. The AC works well even at 55 degrees temeprature when the advanced MPFI and 6th intellisense cool technology. Moreover, to reduce your electricity bill it has advanced inverter technology. It can save your electricity bill consireably. Other features of this AC include 10 years warranty, turbo cool, 100% copper condenser, and stabilizer free operation. Whirlpool ACs are one of the best AC’s in India and are slowly and gradually taking over the AC market in India. This is not only tested by us but also on various other sites when we searched for Best Whirlpool AC reviews. They have all the basic, moderate, and high-end models in the range of split, split inverter, and window ACs. All the models work great even at the highest temperature and have a remarkable top-notch quality. But the best of the best ones from them are listed above. Our list is not made randomly but it is made after rigorous testing and research. So, be rest assured if you choose any one from the above you will be completely satisfied.